VW South Africa have launched 7 models of the new Golf 7. But no GTi. The new line-up enjoys a number of new engines. The 1.2 TSI with 77 kW is the new entry engine and it replaces the 1.6 MPI 75 kW. The 1.4 TSI with 103 kW and 2.0 TDI with 110 kW engines replace 1.4 TSI with 118 kW and 2.0 TDI with 103 kW respectively. Both engines combine dynamic sporty driving experience and frugal fuel consumption. The combined fuel consumption of the 1.4 TSI engine is: 5.3 l/100 km (equating to 121 g/km CO2) whilst the 2.0 TDI has a combined fuel consumption of 4.5 l/100km (equating to 119 g/km CO2 ). They claim the new the base model 1.2 TSI 77kW with BlueMotion Technology consumes only 4.9 l/100 km. Light Assist main beam control; cruise control system including speed limiter; multi-collision brake; ParkPilot; Park Assist park steering assistant; tyre pressure monitoring indicator; Rear Assist. Dimensions: 4,255 mm long, 1,799 mm wide (without door mirrors), 2,027 mm wide (with door mirrors), 1,452 mm tall, 2,637 mm wheelbase. Drive: Front-wheel drive. Engines – diesel: 2.0 TDI with 81 kW and 2.0 TDI with 110 kW. Engines – petrol: 1.2 TSI with 77 kW, 1.4 TSI with 90 kW and 1.4 TSI with 103 kW. Equipment lines: Trendline, Comfortline, Highline. Fuel tank: 50 litres Infotainment: “Composition Colour” CD/radio (5-inch touchscreen) – standard in Trendline and Comfortline models, “Composition Media” CD/Radio (5.8-inch touchscreen) – standard in Highline models, “Discover Pro” radio-navigation system (8-inch touchscreen) – optional. Production site: Wolfsburg plant and Mosel plant (Zwickau). Running gear: MacPherson-type front suspension; modular lightweight rear suspension (1.2 TSI with 77 kW and 2.0 TDI with 81 kW) and modular performance rear suspension – multi-link rear axle (1.4 TSI with 90kW, 1.4 TSI with 103 kW and 2.0 TDI with 110 kW). Sales: Over 29 million worldwide and 323 100 in South Africa. Model introductions in South Africa: Mk 1 – 1978; Mk 2 – 1984; Mk 3 – 1992; Mk 4 – 1999; Mk 5 – 2004; Mk 6 – 2009. The new Golf model range comes standard with a 5 year/90 000km Service Plan, 3 year/120 000km warranty and a 12 year anti-corrosion warranty. Service Interval is 15 000km. 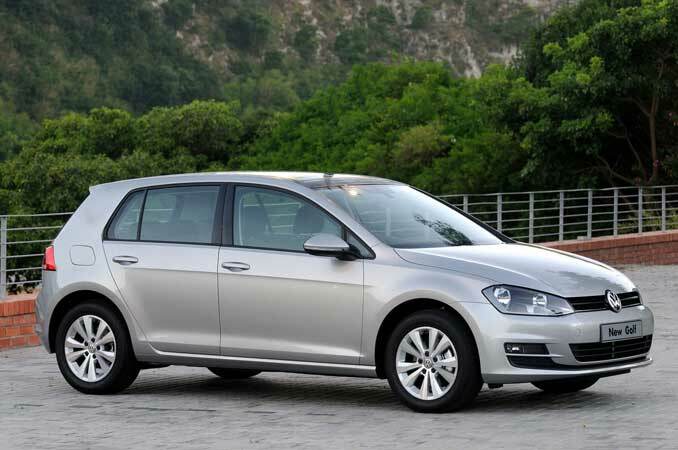 This entry was posted in News and tagged 2013, Golf, Golf 7, new, South Africa, Volkswagen, VW. Bookmark the permalink.